Last year Uli Dahmen and his colleagues were studying the behavior of very small inclusions of lead in a matrix of aluminum, using the Analytical Electron Microscope at the National Center for Electron Microscopy (NCEM), which allows the sample's temperature to be varied while it is being imaged. They watched the behavior of different sizes of particles as they turned up the heat. Dahmen, a member of Berkeley Lab's Materials Sciences Division and head of NCEM, says that what they saw when the temperature rose above 423 degrees Celsius came as a big surprise. Leapin' blobs o' lead! 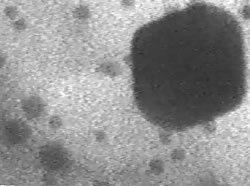 Nanoscale particles of molten lead inside solid aluminum move just as described by Albert Einstein in his classic 1905 paper on Brownian motion. The much larger faceted inclusion at upper right is also molten, but is confined by the solid matrix. "We knew that really small particles of lead in aluminum -- particles only a few nanometers wide -- superheat enormously before they melt," says Dahmen, explaining that while lead in bulk melts at 327 degrees Celsius, a five-nanometer inclusion can get 100 degrees hotter before it melts. "But when they do melt, they jump at you! They move so fast they make you blink." Since bulk aluminum's melting point is 660 degrees Celsius, this frantic movement of tiny blobs of liquid lead was occurring within a still-solid aluminum matrix. The startling phenomenon had been seen before by Bjarne Schmid, who in 1992 was a graduate student of Dahmen's collaborator, Erik Johnson, at the University of Copenhagen. But an adequate analysis of the particle motion wasn't possible at the time, and Schmid's observation appeared only in his doctoral dissertation. Electron microscopes and computers have come a long way in the years since 1992. The configuration of the Analytical Electron Microscope, whose operations are supervised by NCEM's Tamara Radetic, allowed Dahmen and his coworkers to videotape the movement of the liquid particles as they zipped about. After analyzing the videos with powerful desktop computers, using image-analysis software created with the help of NCEM's John Turner, the collaborators confirmed what their eyes had led them to suspect: the rapid motion of the lead particles was an example of classic "Brownian motion." 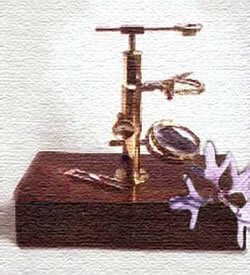 In 1827, using a magnifying glass to examine wildflower pollen grains in water, the Scottish botanist Robert Brown "observed many of them very evidently in motion" and soon determined that these motions were not due to water currents or evaporation but apparently "belonged to the particle itself." At first attributing the activity to life, he eventually found that any sufficiently small particles, even particles of ground-up rock or glass, moved in the same way -- and kept on doing so ad infinitum. In 1827, using this single-lens microscope, Scottish botanist Robert Brown first observed what came to be called Brownian motion among grains of pollen from a North American wildflower, Clarkia pulchella, suspended in water. For almost 85 years Brownian motion was argued about but never explained, until in Albert Einstein's "miraculous year" of 1905 -- the same year he proposed the special theory of relativity and the quantum nature of light -- Einstein, who was only distantly acquainted with Brown's work, published a theory giving precise formulas for predicting the behavior of small particles of a given size suspended in liquid at a given temperature. Einstein's explanation, in a nutshell, was that the particles are being randomly knocked about by collisions with the energetic molecules of the liquid. The higher the temperature, the faster the molecules move, and the harder they bump into anything that gets in their way. "Active Molecules," by the way, are what Brown called his pollen grains; Einstein's molecules (our modern molecules) are much, much smaller, although in both cases the meaning is "small mass." The reality of atoms and molecules was still in dispute when Einstein wrote, and his paper was intended to suggest a way of confirming their existence as well as calculating their size. In the case of nanoscale inclusions of melted lead in aluminum, it's energetic liquid that's jumping around inside the crystalline structure of the solid. Nevertheless, by analyzing that movement in their videos, the researchers determined that Einstein's formulas describe it to a T.
"One measure of random movement, as Einstein described it, is that when you add up the displacement of the particle in each unit of time, the mean displacement should be zero," says Dahmen. That is, in Brownian motion, the magnitude of any bounces in one direction will eventually be offset by bounces in other directions, true for all directions. 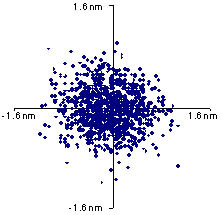 A scatterplot of the motion of a molten lead particle in solid aluminum shows that the distance and direction of each displacement, measured at intervals of one-thirtieth of a second, are randomly distributed about the graph's origin. Another way to test whether a particle's motion is Brownian is to determine its fractal (or fractional) dimension. A jagged curve on a plane, for example, which is neither a smooth, one-dimensional line nor a two-dimensional surface, will have a fractal "dimension" somewhere between 1 and 2. The trajectory of a molten lead particle in solid aluminum at 438°C, determined from 1,056 video frames. To allow trajectories to be tracked and accurate statistics of frame-by-frame movement to be compiled, NCEM's image-analysis software had to "grab" every frame of a thousand frames of video, follow the center of mass of specific particles, and correct for drift of the image -- a process requiring the acquisition of several thousand data points per frame, which even on a fast computer consumed hours. "In principle this could be done by hand, but it would take forever, and the accuracy would be lousy," Dahmen says. The confirmation that Einstein's theory of Brownian motion applied in most circumstances had important implications for the study of alloys. Einstein's theory allows one to calculate the rate of diffusion of a Brownian particle through the surrounding medium, knowing only its size, the temperature, and the mechanism of an elementary step through the crystalline solid. "This may allow us to determine diffusion constants for different alloys by observing the behavior of individual particles," says Dahmen. "By recording particles of known size at, say, five different temperatures, we can calculate the activation energy of the diffusion process." Having confirmed the Brownian character of the particle motion they first observed, the researchers also noted circumstances when it was definitely not random. "These are the most interesting," Dahmen says. For example, "in some cases there is interaction -- the particles 'talk' to each other." Particles of some sizes seem to travel as a group, while smaller particles (though rarely) even seem to repel one another. Why do some particles coalesce and others keep their distance? Promising ideas are under investigation, but at this point "I wonder too," Dahmen laughs. "Our discovery of the Brownian motion came as an outgrowth of our studies of 'magic sizes,'" Dahmen notes, a phenomenon he and Erik Johnson and their coworkers described in the late 1990s. 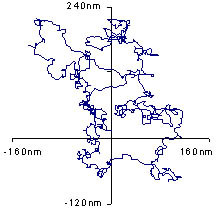 Nanoscale lead inclusions in aluminum occur only in some sizes and not in others. (The two metals were deliberately chosen because they don't readily mix, and they melt at quite different temperatures.) Moreover, the regular crystalline shapes of larger inclusions is lost in smaller ones, whose truncated forms minimize their energy as they interface with the aluminum; this difference in crystal shape as well as size has an important influence on their melting temperature. It's evident that size differences are important in the way melted particles move as well, with smaller particles moving much faster. Other behaviors also vary by discrete sizes, and research to understand these size-dependent behaviors is ongoing. A number of exciting questions are still open, including the diffusion mechanisms by which liquid particles move through a solid matrix, and nonrandom particle activity near defects or grain boundaries in the matrix. The exotic nanoscale behaviors of a seemingly unromantic metal alloy have opened a vista of research possibilities for microscopy. Says Dahmen, "We have found a zoo of behaviors with a simple binary system of lead and aluminum." Notices of this work by U. Dahmen, T. Radetic, J. Turner, S. Prokofyev, M. T. Levinsen, and E. Johnson appear in Proceedings of the International Congress on Electron Microscopy-15 and Proceedings: Microscopy and Microanalysis 2002.